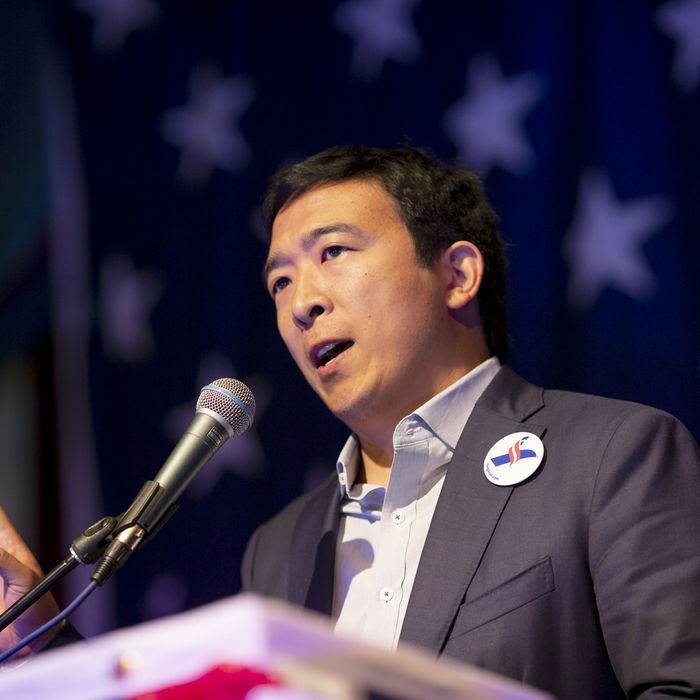 Andrew Yang may not yet be a household name, but he’s a bona fide superstar online. One of a seemingly endless stream of Democratic candidates for president, the 44-year-old Yang, an entrepreneur who has no political experience, is basing his campaign on one very big idea: universal basic income, or UBI. Yang wants to give every American $1,000 a month, paid for via a consolidation of welfare programs and a value-added tax. On the strength of that hyperfocused platform, plus some other technocratic but unorthodox policy positions — eliminating the penny and permanent daylight savings time among them — Yang has fostered a devoted fan base of young, meme-loving voters, who call themselves the Yang Gang (or #yanggang, for online purposes). He has also earned the unlikely devotion of a less desired group: white nationalists. Intelligencer spoke with Yang about his burgeoning campaign, what he plans to say at the Democratic debates, and his unsavory admirers. You told the New York Times recently that there will be “riots in the street” in the coming years as a result of 1 million truck drivers losing their jobs through automation. Are you saying that the economy won’t fill in any of the economic gaps with new jobs and industries, the way it has in previous times with technological upheaval? Certainly there will be many new jobs created, and many of the impacted truck drivers will leave the industry and get retrained. But if you look at our history, in the first industrial revolution, we had mass riots that killed dozens of people and caused billions of dollars worth of damage. And according to McKinsey, and Bain, and MIT, this industrial revolution will be three to four times faster and more dramatic than that one. So even if you were just to take history as your guide, you would expect mass riots at some point with a shift this big. And if you look at what’s going on right now, dozens of truckers — it’s something called the Slow Roll, in Indianapolis, where they slow down traffic to protest the electronic monitoring of their driving time. If you can imagine their reaction to their livelihoods being threatened, I’m willing to suggest that we’ll see something many times more dramatic. Given America’s culture of workaholism, it might be hard to win the public over on universal basic income plan, simply on a political level. I was wondering why you prefer this approach — the freedom dividend, as you call it — to other possibilities like a jobs guarantee, which is another old policy idea that’s been gaining steam in recent months and years. I think that putting money into people’s hands will actually become much more popular, much more popular than anyone imagined. And even now, this campaign is getting tons of support from conservatives, independents, libertarians, and others. And of course many Democrats are excited about it too. So I’m not sure about the premise that it’s going to be difficult for Americans to understand that we’re in the midst of the greatest economic and technological transformation in the history of the world, and that we should look back not only at what Martin Luther King and Milton Friedman argued for, but at the fact that there’s been a dividend for 37 years in Alaska that’s proven to be wildly successful, and which has created thousands of jobs in a deeply conservative state. So if you were to look around and say, “Hey, is there a state that has a dividend?” There is! And if you look around and say, “Hey, is there a state with a jobs guarantee,” there isn’t. So I’m not sure I would agree with the premise that one would be easier to pass than the other. But just look at how difficult it is to push any social program through Congress, whether it’s Obamacare or anything else. This would be that times a billion. Well, not quite a billion. But one of the things to note here is that Alaska, the state that has the dividend, is a deep red state, and the law was passed by a Republican governor. And after I’m president in 2021, many Democrats and progressives will be very excited to work with me. Many Republicans and conservatives will look up and say, “Wait a minute. This dividend would help rejuvenate rural areas. It would help revitalize many states in the interior that are being depleted in various ways.” So I think that there’s going to be bipartisan support for this, in a way that you struggle with for many other proposals. Yeah, there was a vote a number of years ago for Switzerland, but they suggested an average income of approximately $36,000 a person, which is quite high. And that did not win. Now, the Finland trial was not even universal basic income. What it was was cash transfers to a relatively small number of unemployed people. And even there, the data was very positive on dimensions like mental health and optimism and physical health. So there’s a lot of misinformation about that, but the Finland trial wasn’t even truly universal basic income. And what you’re going for is significantly less than $36,000 a year. It’s up to the poverty level. Yeah, that’s right. The poverty level’s around $12,700. Reading interviews with you, you’ve ascribed a lot of the anger in society right now, the kind of anger that got us Donald Trump as president, to people losing their jobs. But study after study shows that Trump voters were more motivated by cultural resentment, by immigration, by a feeling that white people are increasingly being left behind in America. And millions of those voters already have pretty good jobs. Do you think it’s possible that solving this automation problem won’t result in any more of a harmonious country or society than we currently have? If you can’t pay your bills, it has a really tough effect on your mental state. And so I certainly don’t think that there’s any one single explanation. Yes, that’s exactly right. So if you have a group of people that feel like their future is more economically insecure, might that group also be more receptive to various ideas that scapegoat other people? It’s all interrelated. I would not suggest that giving everyone $1,000 a month is somehow going to heal every division. But I would suggest that it would take the pressure off of many Americans to a level that would enable us to at least start doing the work of bringing people together. Another one of your planks is “human-centered capitalism” — a vision of a less corporate-focused system than the current one. How does it differ from ideas being put out by candidates like Bernie Sanders and Elizabeth Warren? I think that we have to evolve to the next stage of our economy. And technology is changing many of the rules of capitalism in fundamental ways. Now, I line up with other Democratic candidates on many elements of our platforms, but I think I have a different emphasis on upgrading our economic measurements so that they would matter to American families, and then actually trying to drive resources in those directions. To me, it’s not about either socialism or capitalism. It’s about trying to make our economy work for human goals and values. I’m not going to compare that to other ideas that the others are proposing, because for all I know, they see their plan in the exact same way. But one of the things that might be different is that I think GDP is an archaic measurement that does not tell us how we’re doing. If you look at the numbers right now, America’s life expectancy has declined for the last three years, the first time that’s happened in a century. We have record levels of suicides, drug overdoses, and mental health problems. What good is a high GDP if your people are killing themselves or dying of drugs? And so you need measurements that actually correspond to how we’re doing, and then hopefully you can direct resources towards making those problems better. I’m about trying to measure our economy differently, because GDP is something we made up almost 100 years ago during the Great Depression, and it’s long past overdue for an upgrade. What is a better way of measuring it, other than life expectancy? I really like the labor force participation rate, which, if you used that, you’d see that we’re at 63.2 percent, close to a multi-decade low, and at the same levels as Ecuador and Costa Rica. And that’s when we’re in an expansion. So one of the major problems is that we’re cheerleading three numbers: GDP, stock market prices, and headline unemployment. And all three of those measurements are somewhere between flawed and disastrous. GDP will keep going up, even as more Americans get left behind. The bottom 50 percent of Americans own zero stock. And the bottom 80 percent own only 8 percent of stock. So cheerleading stock market prices is really just getting excited about something that’s going on for the richest 20 percent of Americans. And the headline unemployment rate doesn’t take into account people leaving the workforce or people who are underemployed and doing jobs — or multiple jobs — that are not what they would be doing if they had the choice and a better opportunity. Right now, the unemployment rate for recent college graduates, according to the New York Fed, is as high as 44 percent. Does that show up in the headline unemployment rate? Headline unemployment says, “That’s great, this person is a barista.” But then, if you talk to a college grad who owes $40,000 in debt and is a barista because they need a means to live — are they pumped about the headline unemployment rate? Our numbers are leading us astray, and we need new and better ones that actually speak to the realities of 2020. You’ve made some pretty unconventional appearances for a Democratic presidential candidate. You went on Joe Rogan’s popular podcast, which was a breakthrough moment for the campaign. And you were on Tucker Carlson’s show shortly after that. Can you describe the kind of person you’re trying to reach with this unconventional strategy? I’ll share our policy, which to say “yes” to just about any media request that has a significant audience. Is not like I turn down MSNBC or CNN in favor of these other outlets. It’s that they’re the only ones that would have me on. So I wouldn’t lay it at the feet of some brilliant media strategy. I’m an entrepreneur trying to let the American people know that it’s not immigrants that are causing economic problems, it is the fact that our economy is advancing in ways that is making human labor less and less essential. And so I was taking advantage of any opportunity to speak to a large number of Americans in an honest way. Has the level of media interest changed at all? It’s changing as we speak. More people are hearing your name now. Yeah. More people in the media are becoming aware of the campaign — today or tomorrow I’m going to clear the 65,000 individual-donor threshold, which is necessary to qualify for the Democratic primary debates. [Yang cleared that mark last week.] And so now, just about every mainstream press outlet will have a desire to talk to me, because they know I’m going to be at the debates in June and July. Let’s hear your strategy for the debates. The trap you get into is thinking that you only have 12 minutes to make an impression on the American people. And you have some canned line or zinger that you’re just waiting to bust out on people. And then when everyone hears it, they actually groan. So I’m just gonna keep doing what I’m doing, which is try to convey both the reality of the magnitude of the problems we face to the American people, and advancing meaningful solutions. I’m excited about the debates. Many Americans will be meeting me for the first time, but I think making too much of that particular opportunity would be a mistake. There’s another single-issue candidate who might be there with you, Jay Inslee. Do you think climate change is on equal footing as universal basic income in terms of importance? I think climate is an existential threat to our way of life, as the last four years have been the four warmest years on record. But I think the issues are actually incredibly intertwined, because if you have a population that can’t pay its bills, it’s very, very hard to get people focused on climate change. Right now, 78 percent of Americans are living paycheck-to-paycheck, and 57 percent can’t afford an unexpected $500 bill. So, if you say, “Hey, we need to combat climate change,” they’ll look at you and say, “I can’t pay my bills. The penguins can wait.” And so, by putting $1,000 a month into Americans’ hands, we can start focusing on the big problems. And climate change is the biggest problem of them all. You’ve become an internet favorite, including on places like 4chan and Reddit, where Andrew Yang memes have proliferated among white nationalists — who have somehow interpreted your message as being in line with their beliefs about preserving racial hegemony. What’s going on there? Most people looking at it realize that we did not intentionally court anyone, and also that I’m the son of immigrants and one of the first Asian-Americans to run for president. And there’s no place on this campaign for anyone who has a racist or bigoted or white nationalist or alt-right or anti-Semitic agenda. And we’re going to focus on bringing a positive message to the American people. Ninety-nine percent of the people that support me are excited about solving problems. Other than the extreme elements, are you enjoying your enthusiastic online fan base? Oh yeah, I mean, it’s a lot of fun seeing your face on top of various animations and what not. I find those hysterically funny. It’s really entertaining. I like seeing that. And that’s the spirit I take it with. Do you have a favorite meme of yourself? I think there’s like a dragon. He looks sort of vaguely Asian and he’s friendly.